Photo by Erin Hinrichs, MinnPost. 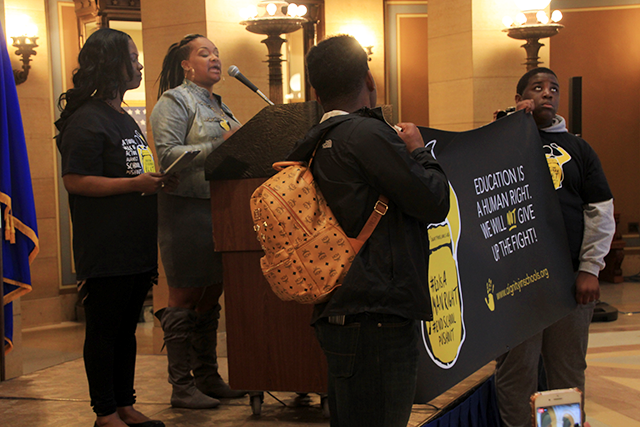 Following an investigation by the Minnesota Department of Human Rights, 10 school districts and charter schools will enter agreements to address these disparities or face litigation. The agreements would reduce discipline, especially suspension and expulsion, for non-violent and non-drug-related offenses such as swearing, eye-rolling, or other behavior deemed inappropriate. Along with 16 states and several cities and mayors, Minnesota has joined the lawsuit against the inclusion of a citizenship question on the 2020 Census. Many people of color and immigrants fear that answering census questions could be used against them, especially for deportation. National Urban League President-CEO Marc Morial calls the question a “veiled backdoor effort to suppress the African American vote,” and notes that over 6 percent of black children were undercounted on the 2010 census. Read more at the Minnesota Spokesman-Recorder. The Latino Youth Development Collaborative (LYDC) has trained promotores y promotoras de educación to be advocates for Latinx education in the Minnesota school system. The promoters will conduct a number of activities – things like assisting parents in accessing resources provided by the state, as well as helping parents report violations of parents’ or students’ rights. Minnesota has the lowest rate of Latinx youth graduating from high school in the nation, and LYDC hopes for this program to bring about change.